To kick the week off, ministers, ambassadors, senior public officials, and civil society representatives gathered on Sunday, September 21, for a breakfast meeting hosted by PMNCH, Countdown to 2015, the independent Expert Review Group (iERG) and World Health Organization (WHO). At the event, PMNCH and iERG launched their annual reports. Additionally, a heavy emphasis was placed on Countdown to 2015’s 2014 report, launched at the Partners’ Forum. To learn more click here. The day continued with the evening reception to celebrate progress and #Commit2Deliver for the Global Strategy for Women’s and Children’s Health. This event co-hosted with Women Deliver, Girls’ Globe, FHI360 and Johnson & Johnson also marked the launch of #MDG456Live, a digital communication platform that provided comprehensive and real time coverage of women and children’s heath related issues throughout the week. You can see photos from the event here. The 4th Annual Every Woman Every Child Private Sector Lunch, took place on Thursday, September 25th at UN Headquarters. Innovators from both the public and private sectors announced additional commitments to advance the Global Strategy for Women’s and Children’s Health. Commitments were announced from: Philips, Medtronic Foundation, Medela, General Electric, Reliance Foundation, Novo Nordisk, BSR-GAIN, Royal DSM, GSK, GSMA, International Federation of Pharmaceutical Wholesalers Foundation and Nike Foundation totaling more than $69 million in value. The event concluded with a special session on Ebola and the crucial role the private sector can play in helping the UN respond. You can see photos from the event here. Hosted by the UN Secretary- General Ban Ki-moon, Partnering for Results: Delivering for Every Woman & Every Child Within A Generation High Level Event took place on Thursday, September 25th at UN Headquarters. At the event, heads of state, business leaders, philanthropists, UN officials and civil society announced joint action including new financing and specific support to countries in an effort to save and improve the lives of millions of women and children and accelerate progress to achieving the health MDG before the end of 2015. Responding to the Secretary-General’s call for expanded cooperation for action, the World Bank Group and the Governments of Canada, Norway, and the United States of America announced up to $4 billion in financing support towards MDG acceleration and to improve reproductive, maternal, newborn, child and adolescent health, as well as the creation of a Global Financing Facility (GFF) in support of Every Woman Every Child. To learn more about this announcement as well as see the press release for the event click here. To read Secretary-General Ban Ki-moon’s remarks click here. To watch a recording of the event click here. 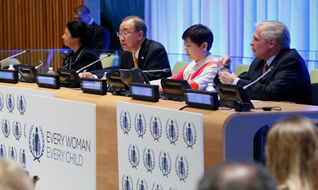 To view a full list of media coverage of Every Woman Every Child’s 2014 UNGA events click here.